Mendi graduated from Chester County High School in Henderson, TN in 1997. 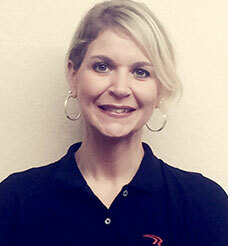 She previously worked in office settings and also as a pharmacy technician, all in Jackson, TN. Mendi joined Redden Total Therapy in June of 2015. Her duties in the clinic include scheduling, insurance authorizations, keeping patient records up to date, and communicating with physician’s offices, case managers, insurance companies and patients. Mendi currently lives in Henderson, TN with her 4 children. Her spare time is filled with family outings, school activities and 2 of her children are involved in sports. She loves her family, music and outdoor activities.